Serving Kansas City for over 30 years!!! 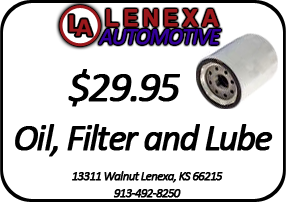 Lenexa Automotive has ASE Certified Master Technicians, the latest computerized diagnostic equipment, and a computerized automotive information system that provides detailed data for your vehicle by year, make, and model. This ensures that your vehicles repairs and maintenance are in complete compliance with the manufacturer's warranty. Other information includes lists of "high-tech" speciality lubricants required for your particular vehicle, the latest service procedures and diagnostic information, and factory-issued Technical Service Bulletins. The bottom line is efficient, dependable, and cost-effective service for you. 10% off $200 of Labor!!! On a tight schedule? Bring your vehicle in after hours and drop the keys in the night drop box. Click the link below to schedule a night time drop-off. Our service department is open Monday through Friday 8:00am to 6:00pm. Copyright © Lenexa Automotive. All rights reserved.